Why is Saint Juan Diego so Important? Saint Juan Diego is the patron saint of indigenous peoples. He is not just recognized as the first Roman Catholic indigenous saint from the Americas, he is well known for having seen an apparition of the Virgin Mary four times. We celebrate his feast day every year on December 9. As this date approaches, let us look back at his life and what made him an exemplary person. Born in 1474 as Cuauhtlatoatzin (which translates to “the Talking Eagle”), Saint Juan Diego was a native of Mexico. After the death of his father, he lived with his uncle where, from the age of 3, he was brought up under the Aztec pagan religion. From a young age, he already showed signs of having a mystical sense of life. He was characterized by a religious fervor and reverence for the Virgin Mary and the Bishop Juan de Zumarraga. He also had devotion and compassion for his ill uncle. In 1524, a group of 12 Franciscan missionaries arrived in Mexico. Juan Diego and his wife, Maria Lucia, converted to Catholicism and became the first to be baptized in the region. He was very devoted to his new life and this devotion manifested in how he would walk long distances in order to receive religious instructions from the Franciscan mission station in Tlatelolco. Mary instructed Juan Diego to ask the local bishop to build a chapel in her honor on Tepeyac Hill, which had been the site of a pagan temple. 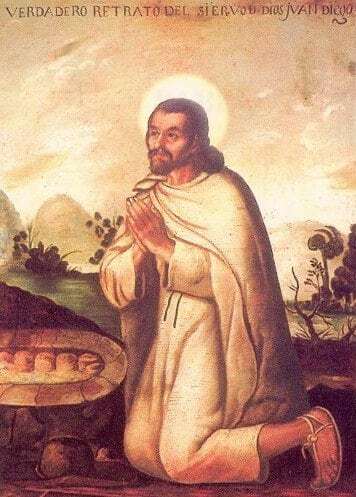 When he relayed the request to Bishop Juan de Zumarraga, he was doubtful at first and asked that Juan Diego give him time to ponder over the news. 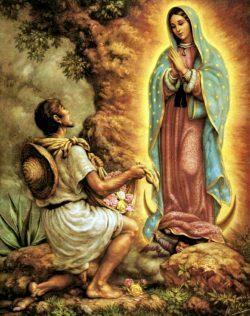 Later that day, the Virgin Mary appeared once again to Juan Diego and he told her that he had failed at getting her request granted. He tried to explain to her that he was just an ordinary person and not the right one for such an important duty but the Virgin Mary insisted that he was the man she was looking for. He returned to the bishop the next day and once again told him of the request he was given. This time, the bishop asked him for proof that his vision was indeed real and divine. Juan Diego immediately went to Tepeyac where the Virgin Mary appeared to him for a third time. He explained the bishop’s concerns to her and she agreed to give them proof the next day, December 11. On December 11, Juan Diego could not make it to the meeting because his uncle was stricken with illness and he was obliged to stay home and look after him. The next day, he set out to find a priest for his ailing uncle and was ashamed to encounter the Virgin Mary because he missed the previous day’s meeting. The Virgin Mary told Juan Diego that his uncle would be healed and instructed him to climb a hill and collect flowers growing there. Even though it was December and the terrain was rocky, he found many flowers in bloom on the hill. He then filled his cloak with the flowers and returned to the Holy Mother. 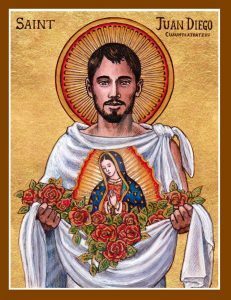 The Virgin Mary then arranged the flowers in Juan Diego’s cloak and informed him that this would be the sign he would show to the bishop. When he arrived in the bishop’s presence, he opened his cloak to reveal a miraculous image of the Holy Mother printed on the flower-filled cloak. The next day, Juan Diego’s uncle was cured from his sickness just as the Virgin Mary promised. His uncle told him that Mary also revealed herself to him in a vision and restated her request for a church on Tepeyac Hill. Mary told him she wanted to be known with the title of Guadalupe. The church was finally built on Tepeyac Hill the next year. Juan Diego’s cloak with the miraculous image was put in display on the church. News of the apparitions of the Virgin Mary caused many Indians to convert to the Christian Faith. As much as 3,000 Indians converted every day because of Juan Diego’s inspiring story and the Holy Mother’s words. 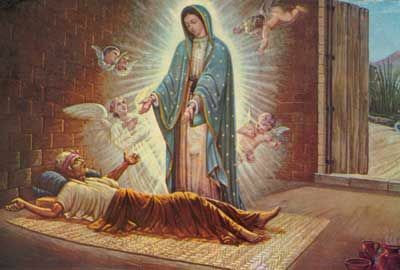 Many miracles occurred throughout Saint Juan Diego’s lifetime and he became well known for them. Despite achieving a certain popularity, he remained a humble man. One miracle happened when a procession was headed to Tepeyac Hill. In the midst of the celebration, one of the participants got shot with an arrow. They placed the injured man in front of the image of Mary and he was miraculously healed. Saint Juan Diego moved to a small hermitage situated on Tepeyac Hill. He lived a simple and solitary life characterized by prayer and work. He lived his remote settlement until his death on December 9, 1548. Juan Diego’s miraculous cloak has remained in good condition until the present day. The Basilica of Guadalupe, the church where it is displayed, is one of the world’s most visited religious sites. Juan Diego was canonized on July 31, 2002. Stay close to your faith with these Saint Juan Diego and Our Lady of Guadalupe inspired gifts.